Home #IHFundance AIHA AIHce cautionary tales CIH Industrious Hygienist lab safety Sock Puppet Safety www.AIHA.org We won! Thanks for voting in the #IHFundance Film Festival Competition! We won! Thanks for voting in the #IHFundance Film Festival Competition! 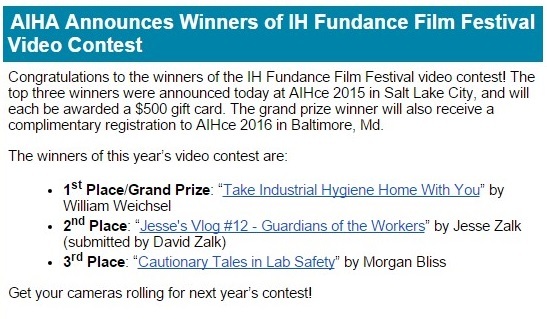 Our Sock Puppet Safety video won THIRD PLACE in the IH Fundance Film Festival, held as part of the 2015 AIHce Conference. We're excited to use our winnings to make - you guessed it - more free safety training videos on YouTube featuring our adorable sock puppets! Sock Puppet Safety won 3rd Place in the #IHFundance competition! 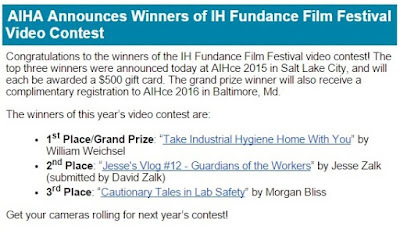 The first place award went to "Take Industrial Hygiene Home With You" by the industrial hygiene students at University of Michigan, and the second place award went to "Guardians of the Workers" by Jesse Zalk, the son of David Zalk, PhD, CIH. Congratulations to our fellow winners! We'd also like to give our own Honorable Puppet Mention to the entry entitled "What Should I Be When I Grow Up?" by Kate Cole. Sock Puppet Safety - Mad Labs Team: Piper Pangolin, Manny Macaw, Lemmy Lemur. Upcoming topics include hazardous spill response, chemical inventories, eyewash testing, and other laboratory safety topics. We're working on other occupational safety scripts for general workplace safety as well - and are excited to collaborate with other Phoenix-area environmental health and safety specialists for later videos.